(長さに比べて幅の)狭い，細い (⇔broad，→wide) 《★【比較】 大きさ全体の点で「小さい」という場合は small》. This road is too narrow for cars. この道は車には狭すぎる. a narrow circle of acquaintances 限られた知人仲間. have a narrow escape [squeak] 九死に一生を得る. win by a narrow margin 僅少の得票差で勝つ. That's a very narrow view. それは実に狭い見方だ. He's narrow in his opinions. 彼は見解が狭い. in the narrowest sense 最も厳密な意味で. narrow the gap between developed and developing areas 発展した地域と発展途上の地域とのギャップを狭める. The road narrows there. 道路はそこで狭くなっている. We can't be choosy; the choice is narrow. 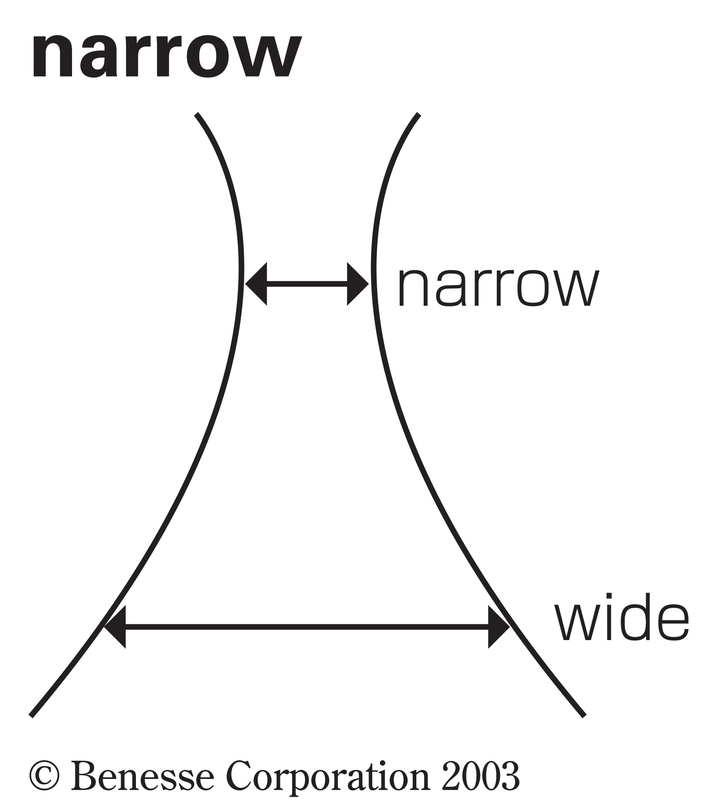 In a narrow sense,“concept"is not the same as“meaning." His views are too narrow. That was a narrow victory. He narrowed his research area. This street narrows at the next corner. (-er型)1)a(幅が)狭い, 細い(⇔ broad, wide).b(標準の幅より)狭い.c〈織物が〉450mm より幅が狭い.2)(広さ・範囲が)限られた, 狭い.3)[通例限定] かろうじての, やっとの.4)((正式))〈検査などが〉入念な(careful), 厳密な(thorough).5)〈心・見解・経験などが〉狭い, 〈人が〉〔見解が〕狭量な〔in〕, 思いやりのない.6)〈収入・資力などが〉乏しい；〈暮しなどが〉困窮した, 貧しい.7)〔音声〕a〈母音が〉狭窄音の, 狭母音の, 緊張音の(tense).b〈音声表記・記号が〉精密表記の《音素レベルへ抽象化せず, 実際の音を表記することをいう》.c=→close１ 14.8)((方言))〔金銭などに〕けちな, しみったれた〔with〕.9)〔畜産〕〈家畜飼料が〉蛋白(たんぱく)質の多い(⇔wide).10)〔経済〕〈値動きなどが〉小幅の, 〈利益・金額などが〉少ない；薄商いの, 不況の. )[通例〜s；単数・複数扱い] 海峡, 瀬戸, 河峡；山間の細道, 峡谷. )[the Narrows] ナローズ水道《米国 New York 湾の Staten Island と Long Island 間の水道》. The road soon became narrower and steeper. 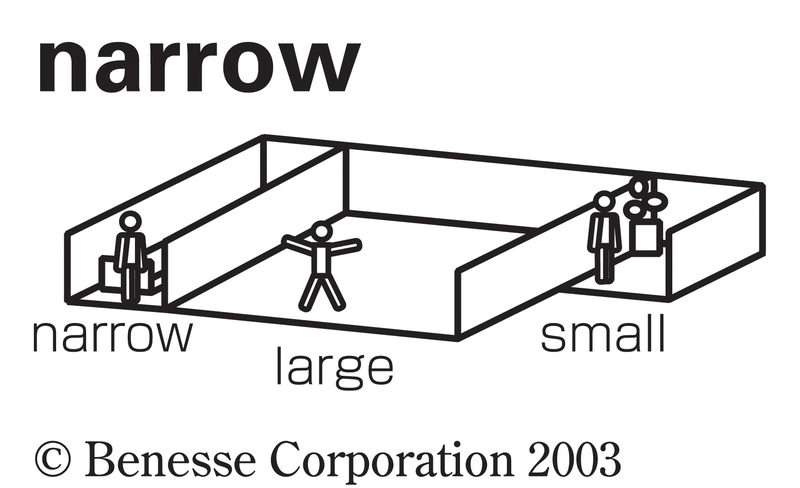 From Middle English narow, narowe, narewe, narwe, naru, from 古期英語 nearu (“narrow, strait, confined, constricted, not spacious, limited, petty; limited, poor, restricted; oppressive, causing anxiety (of that which restricts free action of body または mind), causing or accompanied by difficulty, hardship, oppressive; oppressed, not having free action; strict, severe”), from Proto-Germanic *narwaz (“constricted, narrow”), from Proto-Indo-European *(s)ner- (“to turn, bend, twist, constrict”). Cognate with Scots naro, narow, narrow (“narrow”), North Frisian naar, noar, noor (“narrow”), Saterland Frisian noar (“bleak, dismal, meager, ghastly, unwell”), Saterland Frisian Naarwe (“scar”), West Frisian near (“narrow”), Dutch naar (“dismal, bleak, ill, sick”), Low German naar (“dismal, ghastly”), German Narbe (“scar”), Norwegian norve (“a clip, staple”), Icelandic njörva- (“narrow-”, in compounds). The Republicans won by a narrow majority. As in their narrow defeat of Argentina last week, England were indisciplined at the breakdown, and if Georgian fly-half Merab Kvirikashvili had remembered his kicking boots, Johnson's side might have been behind at half-time. (of a person または eyes) To partially lower one's eyelids in a way usually taken to suggest a defensive, aggressive or penetrating look.